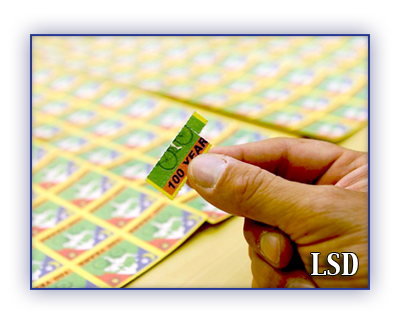 LSD (lysergic acid diethylamide) is commonly known as “acid.” It belongs to a family of drugs known as hallucinogens. LSD is very powerful. Pure LSD the size of an aspirin would be enough for 3,000 doses. Odorless and tasteless, the fine white powder is sold in capsules or as tablets. It can also be diluted in liquid and then absorbed into blotter paper, sugar cubes, gum, candy, cookies, or even postage stamps that can be eaten or licked. Periodically, a rumor goes around claiming that a tattoo called “Blue Star” contains LSD that can be absorbed through the skin. The rumor is unfounded. It is very unlikely that LSD could be absorbed through unbroken skin. Police in Canada have not encountered Blue Star. Possessing, producing and trafficking in LSD can result in fines, prison sentences and criminal records. You can usually feel the effects in 30 to 45 minutes. Effects can last from two to 12 hours. You may feel euphoric (“high”), but this can quickly change to sadness or fear, and back again. You may even feel more than one emotion at the same time. LSD also changes the way you see, smell, hear, taste, and touch. Trivial matters may suddenly seem important, making you feel as if you are going through a magical experience. Sometimes the effects are especially uncomfortable and frightening. This is known as a “bad trip.” If someone is having a bad trip, you can help by calmly reassuring them. Flashbacks usually involve visual hallucinations from past acid trips, but can involve other senses like taste, smell and touch. Flashbacks generally last a few seconds or minutes. For people with psychological problems, LSD use can result in prolonged psychotic states. Although rare, there have been reports of visual disturbances such as prolonged after-images caused by LSD. Deaths from an LSD overdose have never been reported. However, LSD has been implicated in suicides, accidental deaths, murders, and self-inflicted wounds. Some chronic heavy users of LSD show apathy, lack interest in the future, and are easily frustrated. If you use drugs often, you can develop serious personal problems. Using drugs can become more important than your family and friends. You may continue using even when your job or schoolwork is suffering, or when you run into financial, spiritual or legal problems. Young people who use drugs heavily may not learn how to solve problems, handle their emotions and become mature, responsible adults. When used by expectant mothers, LSD may cause birth defects or miscarriages. You can develop tolerance to LSD very quickly. This means that after taking it for several days, you can no longer feel the psychedelic effects. To feel them again, users must abstain for a few days. LSD does not appear to cause physical dependence, even after long-term use. Regular users can become psychologically dependent. They feel like they need the drug and it becomes the center of their lives. Without it, they get anxious or even panicky.